This long, snake-like province runs along the Hexi corridor, which was one of the main paths for the Silk Road. At the southern end of the province it bulges out with the Yellow river slicing across the bulge. For thousands of years caravans went down this desert pathway to reach the markets of China, stopping at the occasional oasis town to refuel or for protection against bandits. Recent archaeological diggings have found that Neolithic people lived in the Gansu area over 10,000 years ago, making the Hexi corridor more important that just recent Silk Road commerce. Today, the north and central parts of the province are predominately Muslim. At one time the province belonged to a vast Buddhist Empire that left hundreds of beautiful grottos across the province. Presently the only Buddhists in the province are Tibetan communities in the south and some Mongolian communities strung all over the province. Gansu is one of the poorest provinces but has the potential to become an economic center thanks to its location as a major gateway to western China and vast natural resources. Gansu is a mountainous desert area. This makes it very hard to travel around the province but makes for stunning beauty. Also the remoteness of the area allows visitors to go to places that very few travelers or locals ever go to. Gansu shares domestic borders with Ningxia, Shaanxi, Sichuan, Qinghai and Xinjiang. Lanzhou is the provincial capital. While it's quite polluted, it does have some charm. Dunhuang is a nice tourist town at the northern end of the Hexi Corridor, with great desert trips and amazing Buddhist caves. Jiayuguan is famous for being the historic end of the Great Wall of China. Zhangye is a nice town located on the Hexi Corridor and has some nice sights. Tianshui is good if you are looking for nice Buddhist statues and less crowds. This town is also the jumping point to the rest of Southeast Gansu. Luomen is home to the famous water curtain caves. Pingliang is near to the holy Taoist mountain of Kongtong. Linxia is a border town between the Muslim and Tibetan worlds. Xiahe is a very nice Tibetan town home to Labrang Monastery. Langmusi is a great little Tibetan town south of Xiahe with horseback riding. Being a mixing ground of different cultures Gansu celebrates every major Chinese, Tibetan and Muslim holiday. And with growing numbers of Christians those holidays are starting to make it into the mix. Gansu is dry and hot in the summer and can be cold in the winter. This place has extreme weather all year but the nice part is very little humidity. Therefore in the summer travellers will not feel the heat so badly. Lanzhou is the major hub for transport to anywhere in the province and for going into western China because all trains going to Tibet or to Xinjiang must pass through Lanzhou. It is easy to take an airplane or a train into Lanzhou from any major city in China. There are several direct trains a day from Xi'an, Beijing, Urumqi and Shanghai, Xining to Lanzhou. To the neighboring province of Ningxia it is much easier to take a bus then a train or plane. There are several airports now in Gansu. The main one is in Lanzhou but there are now smaller airports in Dunhuang and Jiayuguan. There are two main train lines branching out of Lanzhou from Shaanxi province to the east. One train line goes to Xining and one goes to Urumqi. 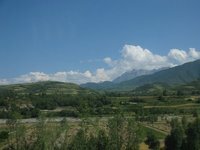 The train line to Xining really only serves to connect Lanzhou to Xining and eventually on to Lhasa. The Urumqi line connects with all the major cities along the Hexi Corridor but sometimes stop at strange times in those towns. Bus is the easiest and most direct way to get around Gansu, especially in the south. Although the buses connect most cities many of the buses are quite old. Also the roads are frequently blocked by landslides, therefore making it easy to get stuck in a town. Lastly the bus companies occasionally go on strike. Gansu is famous for soup noodles. If you like noodles, you're going to be sick of them by the end of the trip. If you don’t like noodles, well then you’re out of luck. Gansu is known for being the home of the pulled noodles called laomian. One of the interesting parts of laomian is that you're supposed to eat it in a food stall. Fancy restaurants just cannot do the dish justice. Laomian can be found anywhere in China but for some reason it is just better in Gansu. Another favorite of this area of China is karouchar, which is meat on a stick. This is usually made from lamb, but it can be anything. Karouchar hamburger, known as Rou Jia Mo, is particularly nice: the vender cooks up the meat on a stick, puts it into a pita-like thing and then fries the whole thing again, putting tons of spices and red chili on it. It is very good, just be careful when eating lots of street food. This is version 20. Last edited at 9:10 on Aug 16, 17 by Utrecht. 23 articles link to this page.